Remington R1 Enhanced with Night Sights 45 for sale with cheap shipping and the lowest price online. 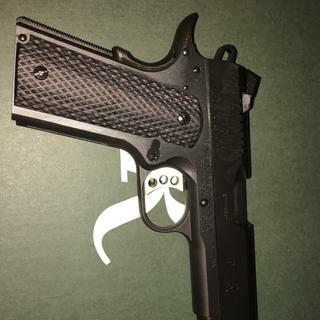 Buy the Remington 1911 R1 Enhanced Black .45 ACP 5-inch 8rd Fiber Sights # 96328 and get cheap, flat rate shipping with no hidden credit card fees and no handling charges at GrabAGun, the cheapest online gun store. 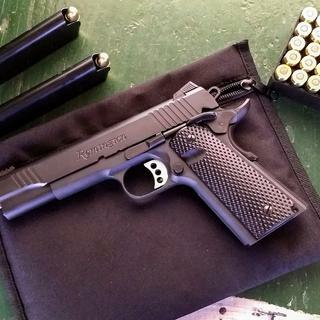 Remington 1911 R1 Enhanced, 1911, Full Size, 45ACP, 5" Barrel, Steel Frame, Black Satin Finish, Walnut Grips, Adjustable Fiber Optic Sights, 8Rd, Target Trigger, Combat Hammer, Slide Serrations, 2 Magazines. Mfr # 96328. MADE IN USA! Wanted a good 1911 that wasn't expensive as my first one. I've been looking for an R1. This enhanced version gave me all the things that I wanted for a price very close to the R1 standard model at other stores and websites. looks like a great deal for a great 1911.
researched this firearm and recieved great feedback. excited to get one in my hands to test for myself. Great reviews, about the Remington R1 Enhanced, and best price, on the 'net! Great price. Pistol was what I was looking for. 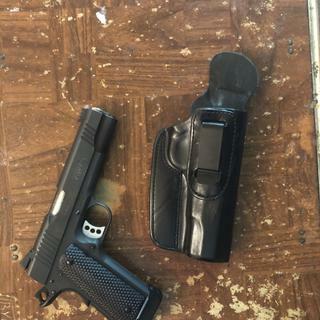 Wanted this Remington 1911 and you had the best price. I have also made other gun purchases with you and I am very satisfied with service, and quick response to orders. Base on reviews and Hickoc 45. One the the best guns for the money. Also wanted an American made 1911. My customer picked your store and my whole sealers did not carry this firearm. Online research, reviews and best bang for the buck..!! Great value and feature rich. remington r1 enhanced has just the right upgrade modifications to make it a perfect 1911. highly recommended by all. always wanted a full size 1911// since my army days! Wanted a 1911 45 and the reviews and price were right. had this same gun 2 years ago & sold it due to collection too big, regret getting rid of it, this remington shoots as good as any high end 1911 & the price is 1/2 less & has awesome fiber optic front sight. highly recommend!!! USN- Retired. It's an exceptional value in terms of features, quality and availability. Chosen for positive reviews (from Youtube and forums) and the phenomenal price. Grabagun great price! Nice pistol. Sweet trigger. Fiber sights are great. Would definitely recommend. So nice for the price. Perfect 1911 for a great price! I’m glad I made this purchase. Shipping was faster than I expected. Love this gun! First 1911 and this thing is a tack driver. Beautiful weapon, great price! Need I say more? Best 1911 for the buck!!! This is one of the most amazing 1911’s for the money. Very well made and has a front fiber optic sight. This gun shoots as good as my Kimber, Sig & Springfield 1911. I had this one a few years ago and sold it and regretted it so I bought it again, now it will stay in my collection to pass on to my son. Great gun, looks and shoots very good would have been nice though if it had come in a hard case instead of just a cardboard box. It is everything positive, you've read, on the 'net. Great trigger pull. Great trigger, shoots smooth as butter, very accurate right out of the box. Shooting super cheap Tulammo with zero misfires, feeds, jams, etc. Over 100 rounds of this all flawless. I may buy another one just like it, I'll be watching for sales. Outstanding gun, a must have 1911! At first sight not what expected , pictures shows gloss finish stainless strigger,but after cleaning oiling shooting and relising grips were Walnut and not plastic.very happy with purchase. It's hard to believe the value in this Remington 1911 R1 Enhanced pistol. With a fiber optic front sight topped by match grade trigger and match grade it is an incredible value. This is the best shooting 1911 I've ever fired or handled let alone owned . As usual, GAG's service and delivery were fantastic. I really like the r1 enhanced it seems very well made and is very accurate right out of the box. Grab a gun was excellent to deal with the gun was at my FFL in 2 days and in my hands in 3. First 1911, very pleased. Can you say 10mm next!! Pistol arrived very quickly. The pistol works very good. Perfect gun...Accurate, Reliable, and a great price! This may be the best all around 45 on the market, especially for the price. It is not too heavy, the trigger pull is not hard, it is all steel construction, and most importantly, it shoots accurately and reliably right out of the box. I love this gun. Purchase went smooth ordered on Friday morning and it arrived at my FFL on Tuesday as they were closed on Monday with no problems. The gun is my first 1911 and is awesome to shoot and very accurate out of the box.the only problem I've ever had was the operator not letting the slide close on it's own when chambering the round. I would diffidently buying from them again. Excellent firearm right out of the package. Definitely takes some getting used to coming from smaller caliber polymer frame pistols. I did find it odd that it didn't come in a case, but that wouldnt be enough to sway me. I'm very satisfied with this being my first 1911. Best gun I have owned at an excellent price compared to competitors. Great groupings and accuracy. Didn’t like the grips. They look great but wear on the hand after 50 rounds. The Remington R1 enhanced is now one of my favorite Guns, you better bet I’ll always have that one in my range bag every time I go to the range . 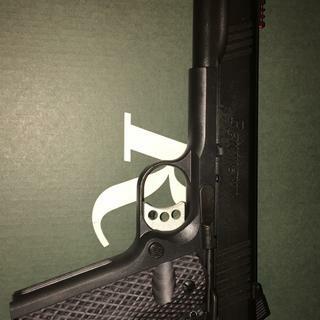 I ordered the Remington R1 , got it in two days, fastest I’ve ever gotten any gun ,shot it and it has the nicest trigger pull in all my 1911’s even ones that cost three times as much, it is now my new favorite gun , I love shooting it!!!!! Love this gun! Definitely worth it for the price. This is the 2nd R1 Enhanced that I have purchased. The first one is Stainless. It is unbelievable how smooth the slide operates on these things. Remington spared know expense, equipping their 1911 manufacturing operation with the latest and greatest CNC equipment and these things come out of the machine with the kind of fit usually reserved for Wilson or Les Baer 1911's. I will keep these two pistols in my arsenal forever, I love 'em! A Great 1911 With A Great Price! I got a great deal on this gun. A local gun shop has it for $350 more than what I paid. I like the fiber optic sight, and I think the gun has an overall sleek look to it. It is an accurate gun, and I’m satisfied with the purchase. I own several hand guns and this one just took over the led. Nothing but good to be said,it is close to perfect! The only fault I can comment on is the front sight. The edges of the sight are close to razor sharp, not really a fault with the gun itself! The gun is tight, near perfect trigger, smooth slide, well balanced with great recoil control and it looks awesome! Great gun. Put 1000 rounds through no jams and no issues. Great 1911 for the money. This gun met and exceeded my expectations. Great value as I would have expected to pay close to double what I paid. This 1911 shoots great, and looks great. Price for my Remington 1911 .45 was the best I found anywhere. Ordering was simple and fast. Have not had as good an experience ordering guns ANYWHERE. Will definitely use grabagun in the future! Shooting the R1 enhanced is a pleasure. I switched to thin grips as I have smaller hands. The gun is very accurate with factory and hand loads perform even better. Great gun. Put 1000 rounds thru it so far with no jams or misfires. Accurate as hell right out the box. Great service and fast delivery! Great gun, very happy with the purchase. Excellent finish. Smooth trigger. Very high quality feeling pistol at a great price from GrabAGun. First range outing. 200 rds, no issues. It’s a good 1911 for the money only thing I found as a negative is the finish around the pistol grip it was thin and started to see metal in no time. I sold it off after about year and went and bought a pair of sigs p229 p226. I’ve owned 5 1911s from 600 to 1200 in price and this one never had a jam. So that’s saying something. hey, just got my rem 1911 enhanced nice finish,tight rec,barrel,nice pistol.BUT THE TRIGGER IS VERY SLOPPY>BAD FIT! having it for about 6 month. same issue as other owners wrote in their review (9mm 's review). rear sight too high, try to tight it down but won't hold for long. so has to aim really high to shoot. Had one lock up first time shooting in range. Other than that... hope it will hold up its reputation. Received the pistol and took it to the range - pistol's action was very tight - after 200 rounds of reloads with 2 FTE (due to my reloads rather than the pistol) the pistol was spot on at 20 yards. 500 rounds later no problem with the pistol at all! An excellent buy and compares to the Colt Commander in accuracy and dependability. I have shot 45s throughout my 28 years in the Regular Army (both good and bad ones) - this Remington stacks up to 1911s costing twice as much - my requirement from a pistol is that it consistently hits the target and it fires when I pull the trigger - this Remington does both very very well! First time GAG customer, will definitely use again. Ordered a Remington R1 Enhanced on a Friday, received at my LGS on following Tuesday. Very pleased with the firearm, shot straight right out of the box. Did require some initial clean up of oil out of the box. Gun didn't come with the typical Remington plastic case, just a Remington box. The R1 has very aggressive grips and needed some sanding down of the points to make it more comfortable. Shot 100 rounds first day at the range with no FTFs or FTEs. Price was much better than any other online seller. First, let me say I was pleasantly surprised that shipping from Grabagun was so fast. I've purchased several times from Grabagun with positive experiences every time. As for my new 1911, it's well built with an almost custom feel to it. I didn't expect it to compete with the $2000 dollar 1911s but am well pleased at the quality. Just be aware these guns are extremely ammo sensitive, and will need to be shot several times before you know what ammo runs reliably in them. Went straight to the range and shot 250rds of Federal 45 ACP 230-Grain FMJ right out of the box and had no issues at all. Tighter groups than my Glock 17 out at 20yds. Can't see anyone not loving this gun. Excellent purchase, excellent value, great gun. This is my sixth pistol I've purchased, and I absolutely love it. One, the sale $609.00 is amazing, lots of good value for that price. Two, the pistol itself is a great shooter. The fit and finish is very well done, good cutouts for the slide and grips that are very ergonomic. The sights jump out at you with the fiber optic insert, and the trigger and a quick crisp release. All in all, great gun, I'd say it might even be a little better than my Kimber Custom I owned. Thanks! The Remington 1911 R1 Enhanced is the easiest handgun to shoot that I own. I have only ran a couple hundred rounds thru it but it has been flawless thus far. I have ordered the same gun in 9MM and expect the same outcome. Grab a Gun had the best price of any site or store. Adjustable rear sight Fiber-optic front sight (red) Beavertail grip safety w/checkered memory bump Enhanced hammer & wide thumb safety Flat checkered mainspring housing (20 LPI) Anodized aluminum Match trigger & Custom wood laminate grips w/thumb grove & ambi-cut.